Ukrainian filmmaker Oleh Sentsov, who was convicted in Russia and has now stopped his hunger strike, has begun working on a script for a film about life in prison, Russian Federal Penitentiary Service deputy head Valery Maksimenko said. "Of course, he [Sentsov] is now eating very little, mainly porridge and fermented milk products. He will continue to do so for some 20 days and then he will switch to regular prison food. Moreover, he has now begun writing a script for a future film. It will be a story about life in prison and inmates. Therefore, inspiration is not abandoning him," Maksimenko said in an interview with the Izvestia newspaper published on Monday. "The Federal Penitentiary Service is constantly monitoring his health," he said. 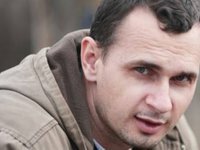 According to earlier reports, Sentsov said he had stopped his hunger strike from October 6 due to a risk of force feeding.